Newsletter No.9. Jan 2019. Special on crime in the area and ways of tackling it. Plus lots of local information. Newsletter No.8. May 2018. AGM and public meeting on school travel plans on 23 May 2018. How to report problems in the area (contact links and phone numbers). Local news on development proposals. 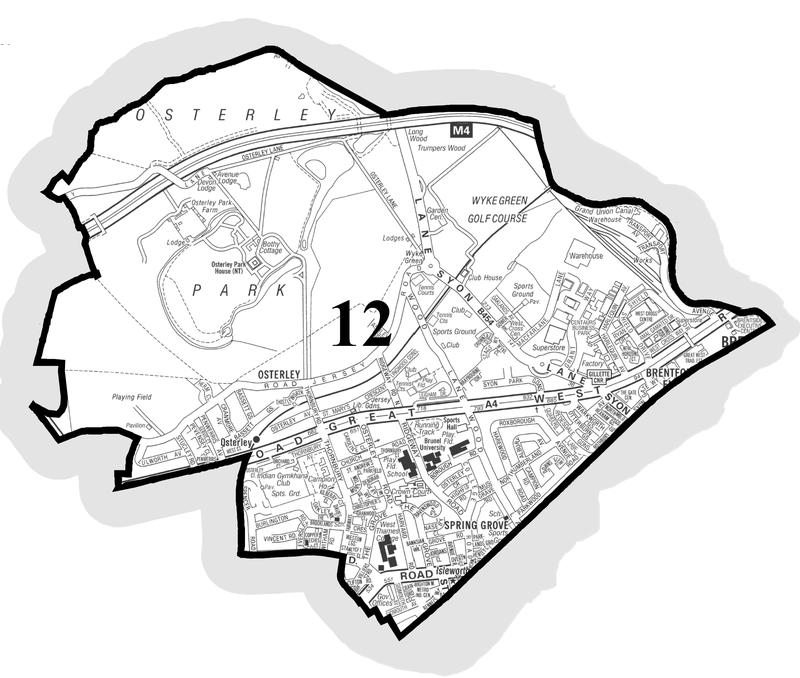 Details of streets covered/not covered for OWGRA Street Reps and Neighbourhood Watch Co-ordinators). Newletter No.7. February 2018. Membership renewal, public meeting on healthcare, Hounslow Highways deep cleansing programme, Committee activities. 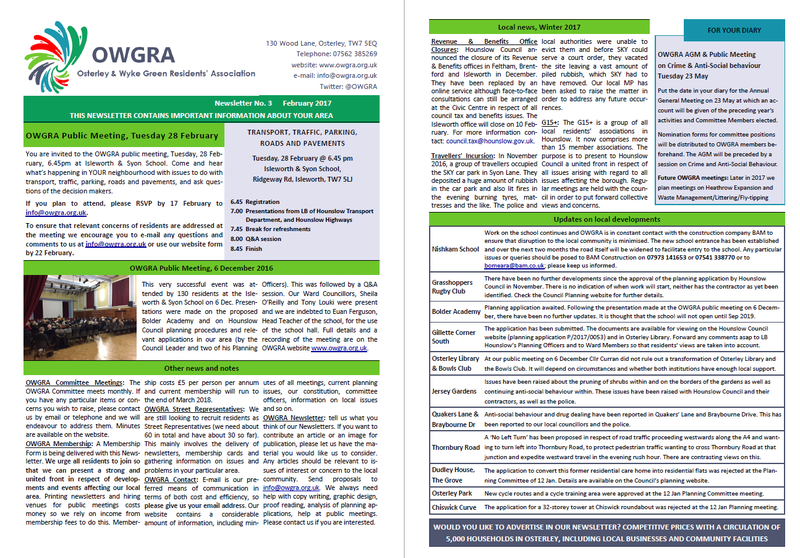 Newletter No.6 November 2017. 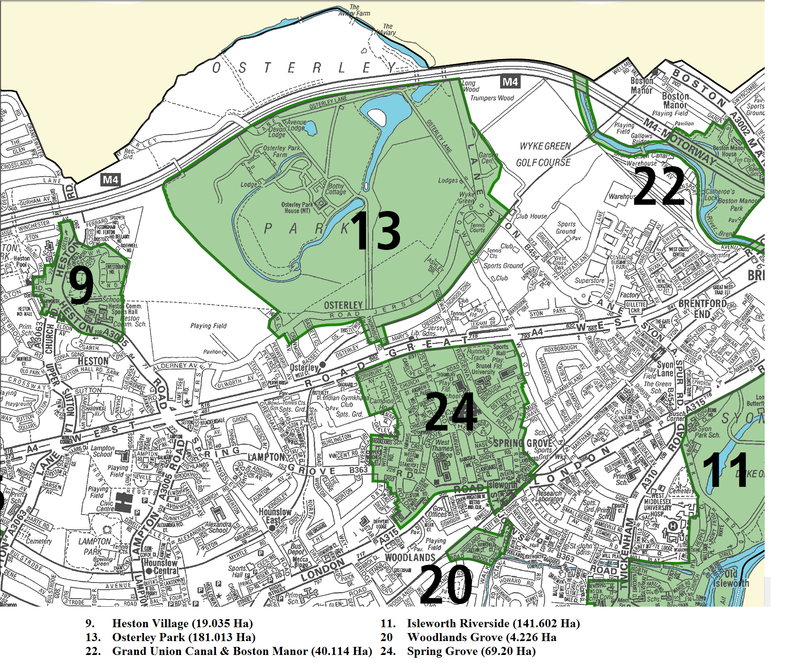 Waste management and fly-tipping + local news (various) and updates. Newletter No.5. September 2017. Policing news (Neighbourhood Watch, crime and anti-social behaviour), local news, planning news. Newsletter No.4. April 2017. 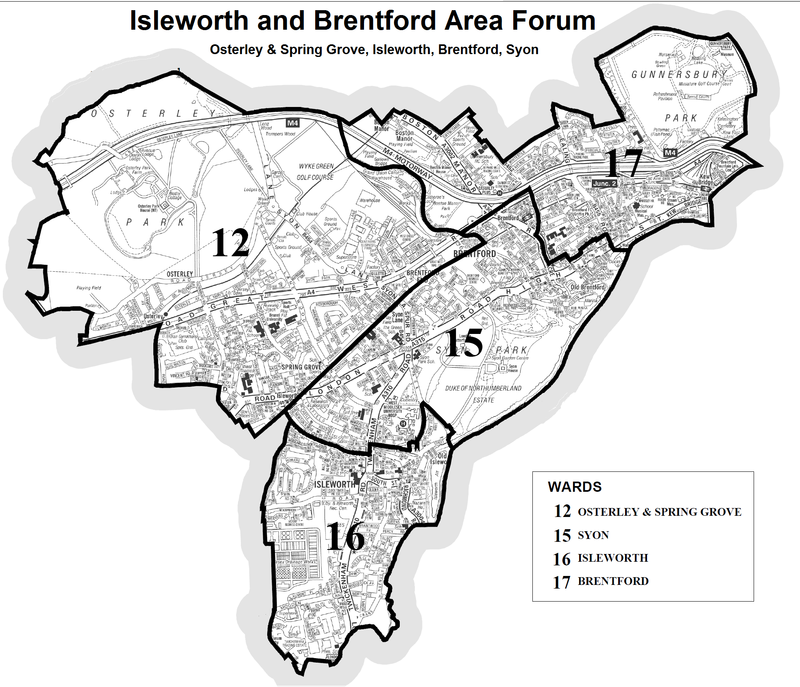 Lots of information about the area plus details of the Annual General Meeting on May 23rd and a presentation and Q&A session on Crime and Anti-social Behaviour. Newsletter No.3. February 2017. Lots of information about the area plus an important meeting for residents on February 28th dealing with transport issues. Download HERE. Newsletter No.2. 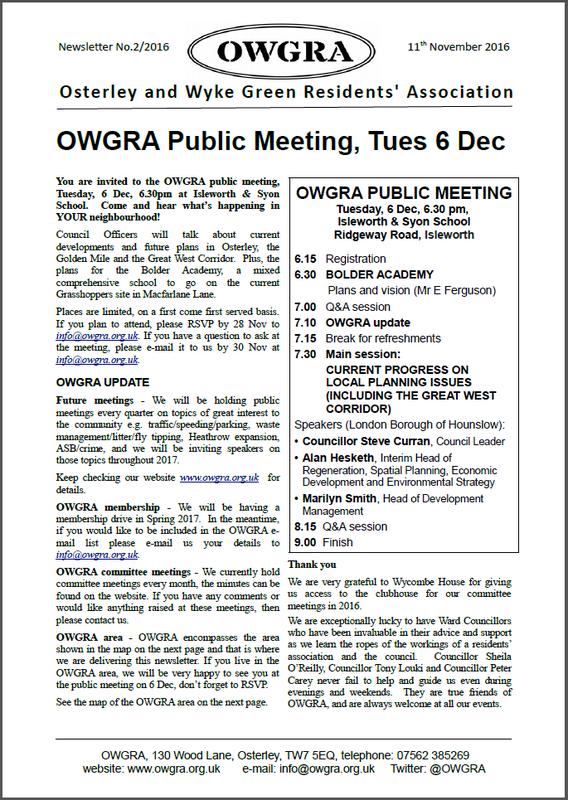 11th November 2016: Public meeting on 6 December, OWGRA update, map of OWGRA area, OWGRA questionnaire, local news, update on local developments. (Many links available directly from the this online edition.) Download HERE. Click on the image to see a larger view of the front page. Click on the link above to download the whole document. Newsletter No.1. 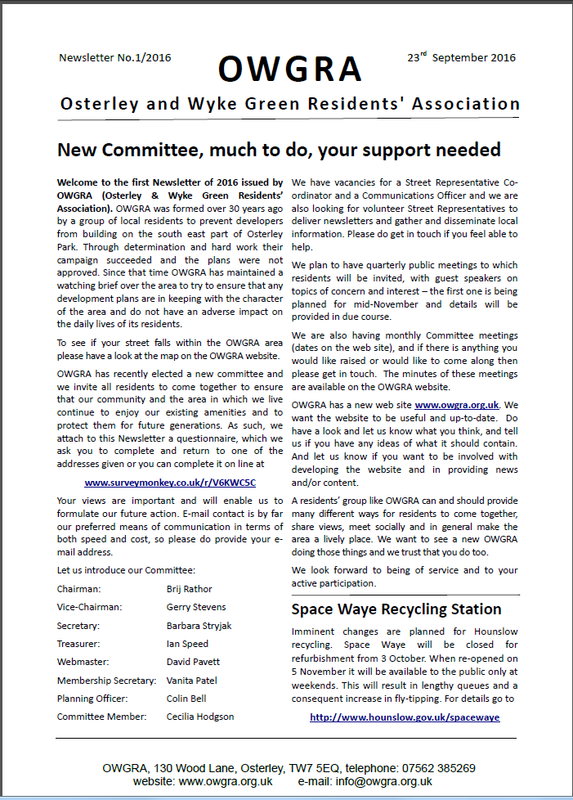 23rd September 2016: Introducing the new committee, Space Waye, Osterley Bowls Club, Neighbourhood Forum, End of KOG campaign. Download HERE. 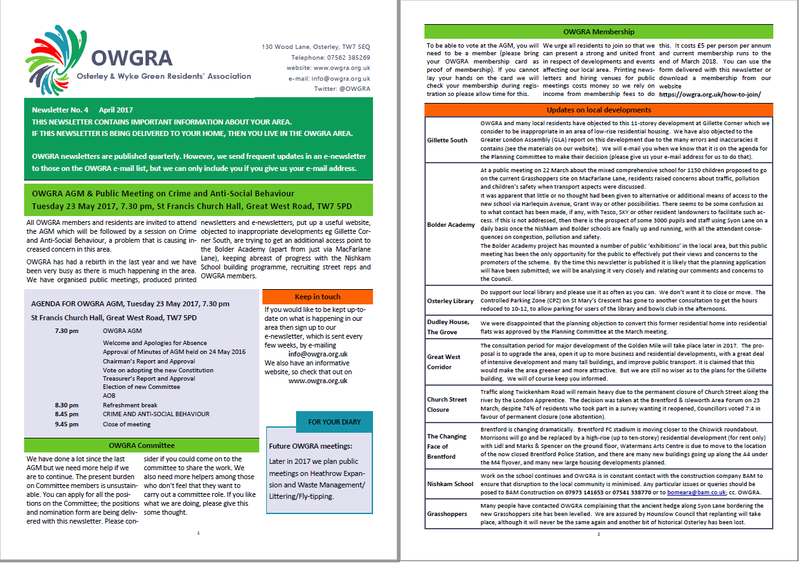 This newsletter was delivered with a questionnaire which you can download here or complete online here.